I find it both ironic, fitting and completely unplanned that positions 1 and 2 in the 30 Days of Diversity represent diametrical opposites and provide a heaven and hell storyline. The Tier 5 Corrupter set is, in every way, the exact opposite of the Avatar set. It simply drips evil and embodies everything horrific and dark about the Warlock class. 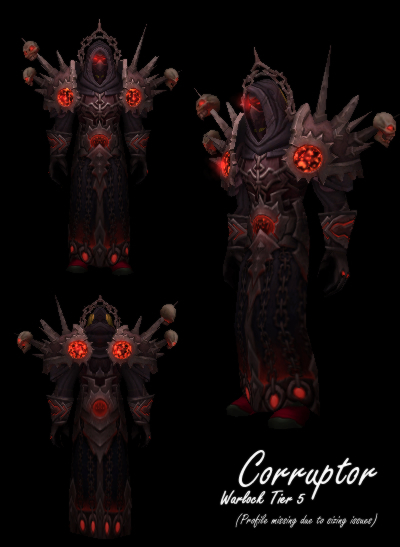 With a dark chained helm, evil glowing eyes, mesmerizing red globes and a set of shoulders that Vlad the Impaler would be proud to wear, the Corrupter set is quite simply the best looking set ever created in, above or beneath the world of Azeroth. It should also be noted that our top 2 sets are both from tier 5… what a year! Now add to this that tier 6 makes up another 2 of our top 5 and I think we know who the best visionaries are/were among the Blizzard legion of artists both past and present. Note: The following was written prior to the announcement that gear customization was coming in patch 4.3. However I find that the comments are best preserved for posterity and have chosen to leave them in, as dated as they may be. After all our Crusade was successful and these words were the mantra we chanted! In closing out this project, I hope you had even a fraction as much enjoyment in reading it as I had in creating it. Blizzard has created so many amazing and varied art assets in their flagship MMO and it is that fact that makes the lack of any mechanic, appearance tab or otherwise to take advantage of those resources so frustrating. It is my profound hope and belief that under current or new leadership, Blizzard will see what is clearly the easiest design decision a fantasy game developer could ever make. Create diversity, create customization… put the RP back in MMORPG. This entry was posted on September 28, 2011 at 10:51 pm and is filed under General, HFL, MMO, Podcast, Raiding, Role Playing, World of Warcraft. You can follow any responses to this entry through the RSS 2.0 feed. You can leave a response, or trackback from your own site. this is one of my fave sets, too. sadly though my lock never had it.